Don’t be fooled by the camouflage fur hat, T-shirts, flip flops and gregarious laugh. only he prefers to deflect the attention and instead talk about his teammates. Adams feels responsible for the game’s future in his country. A version of this story appeared in the February 2018 edition of Thunder Magazine. In the fifth century B.C., the famous historian Herodotus recorded a saga between two allied Greek tyrants. Thrasybulus, who ruled the now-Turkish city of Miletus, advised Periander, Corinth’s leader, as to the best way to safely govern his city. Thrasybulus strode through a wheat field, lopping off the tallest, richest parts of the wheat crop and throwing the crop carelessly to the side. The symbolic point was made – a society that brings down its best and brightest can be controlled. Today, some 2,500 years later, New Zealanders talk about “Tall Poppy Syndrome.” This cultural phenomenon refers to those who attempt to pursue greatness --- or to receive recognition for an accomplishment – and how they are prone to be brought down by their peers, colleagues and public, sometimes even family and friends. No poppy, the story goes, can stand taller than the rest. Researchers at Victoria University, in 2015, and the University of Canterbury, in ’13, confirmed the existence of Tall Poppy Syndrome. Their findings also revealed that some in New Zealand pre-empt the diagnosis by cutting themselves down to size verbally through actual – not sarcastic – self-deprecation. That aspect of human nature, more prevalent in some parts of the world than others, surprisingly doesn’t come with only negative side effects. In fact, the greatest related strength that has arisen is humility. And this is where we begin with Steven Adams. ADAMS is the young, burly, intelligent and quirky center for the Oklahoma City Thunder. While his fashion-forward teammates have turned their arena entrances into must-see photo ops, Adams walks through those same doors dressed in a camouflage fur hat, a NASA T-shirt and flip flops. Don’t be fooled. Underneath that devil-may-care appearance is the present -- and future -- of basketball in New Zealand who also is one of the best big men in the NBA today. Why won’t Adams give himself any credit? When pressed about his personal growth and development, Adams won’t even deliver typical platitudes about hard work or natural gifts. He deflects those questions, dismisses his feats as nothing, and praises teammates and coaches for their part in the process. When he scores on difficult shots, he oftentimes says, “Oh, I’m just throwing it up there, mate” as if every made basket is pure luck. While confounding to reporters, that humble approach to himself and his game has made fitting into an American locker room quite the breeze. IN A SOCIETY that can often be “me-centric”; in a league where contracts, playing time and public admiration are all up for grabs; and with the constant pressure from media and fans to produce statistically, Adams is a breath of fresh air. His personality is gregarious. He attracts attention with the tattoo sleeve on his right arm, his “casual” wardrobe and his flowing ponytail and unkempt beard, but when it comes to stats or accolades, the incredibly selfless Adams seeks little fanfare. “He’s a really an ultimate team guy. 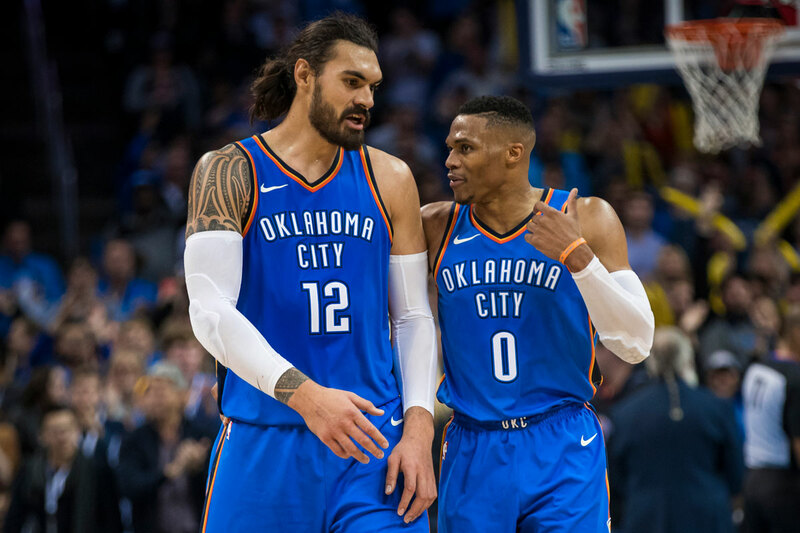 He’s all about the team,” said Thunder Head Coach Billy Donovan, who noticed New Zealand’s cultural impact on Adams during a visit to his center’s homeland last summer. “He’d rather have his teammates have success than himself. He’s a unique player from that standpoint. 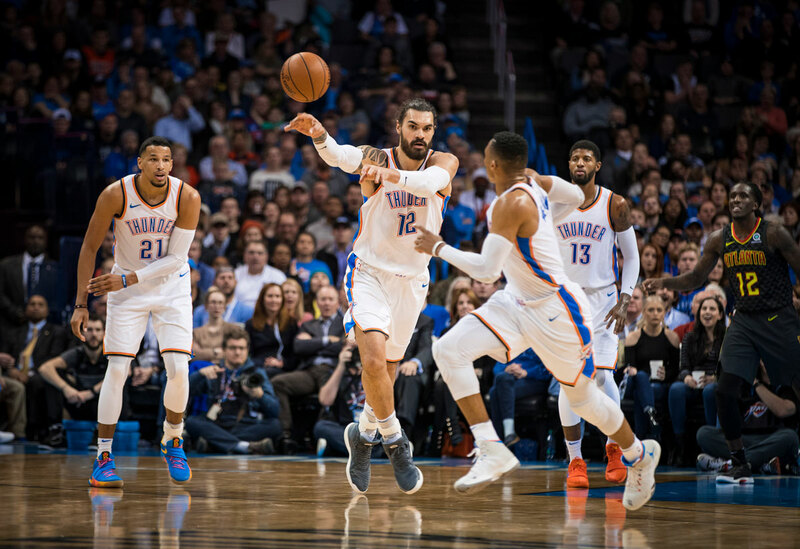 As Donovan alluded, the selflessness with which Adams carries himself in the locker room extends to his work on the court as well, which is the key to understanding why he fits so nicely with the Thunder group. He doesn’t care much about his scoring output, or demand it, but he realizes that it’s an important part of what the Thunder needs to do on the floor. "He’s really an ultimate team guy. He’s all about the team. He’d rather have his teammates have success than himself. He’s a unique player from that standpoint." Instinctively, Adams is more interested in setting great screens to free up teammates, but just as with everything else, he heeds the will of the coaching staff. Adams has made major strides as a finisher around the rim and on floaters and one-handed push shots in the lane. Necessity is always the mother of invention. Adams’ proficiency on floaters was borne from the 2016-17 season, when he was suddenly one of the team’s top offensive options. Defenses were keying in on trying to stop him. As a result, only 55.7 percent of his shot attempts that year came within three feet, compared to 72.1 percent in 2015-16 and 70.6 percent in 2017-18, years when the team was equipped with more shooting along the perimeter to space the floor. This past year, Adams shot a career-best 62.9 percent from the field while scoring a career-best 13.9 points per game. He also more made dunks than any of his previous seasons, with 150 of his 448 made field goals coming on authoritative flushes through the rim. Due to their years together, Adams and Russell Westbrook have a unique connection in the pick-and-roll, but he’s also developing a comfort with some of his new teammates as well. 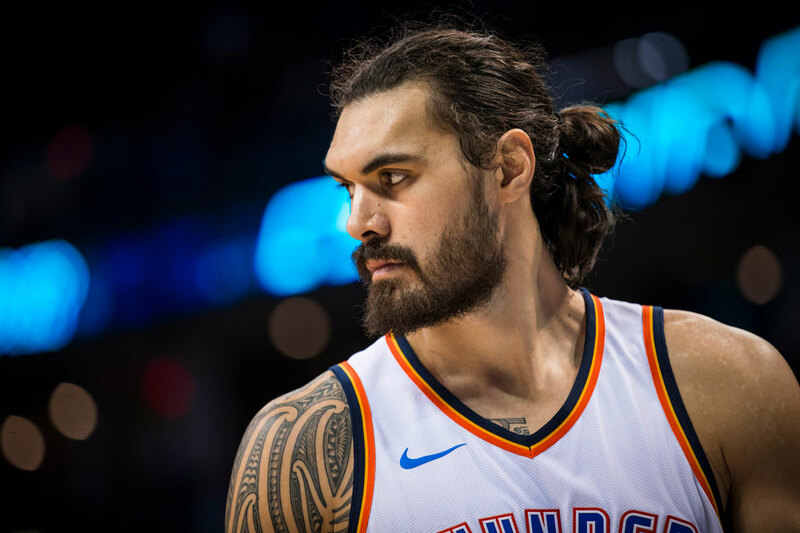 THE OFFENSIVE SIDE of the ball is vital to Adams’ game, but over his years in Oklahoma City, the “Big Kiwi” has developed into the team’s defensive anchor because of his inquisitive nature. 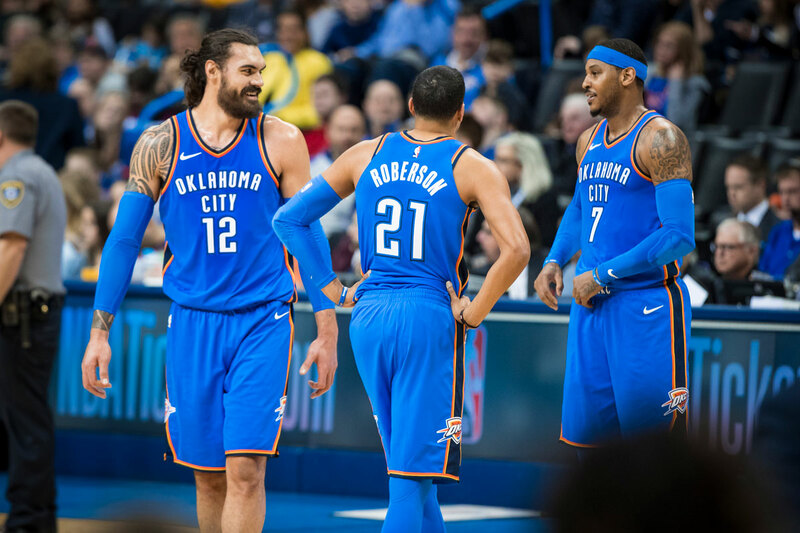 Adams claims he was “dumb as a pile of bricks” before he came to the Thunder, but through work with the coaches, veteran forward Nick Collison and former Thunder center Kendrick Perkins, he’s steadily improved his knowledge of the game and communication skills. His understanding of personnel, timing and nuance in the NBA game has helped him leverage his physical gifts for greater gain. His teammates have been impressed. Adams' defensive versatility – he has the ability to defend four and sometimes five positions on the floor – impressed Anthony early in training camp. The 15-year veteran noted Adams’ ability to switch out onto smaller players coming off a screen. "When you have bigs who are athletic and active like that on the defensive end, it makes everybody alert,” Anthony said. “If they can do it, we all can do it. MARK BRYANT specializes in working with Thunder big men. A 15-year NBA veteran who played in two Finals before moving to the sidelines as a coach, Bryant has made his mark on many young centers and forwards with his baritone voice and grown-man strength. His greatest teachings to Adams have been formulating a routine and committing to working diligently without deviation. Much like Collison and Perkins took Bryant’s tutelage and passed it down the line, Adams is paying it forward with 22-year-old center Dakari Johnson. Before games, Adams quizzes Johnson on opposing personnel, offensive sets and defensive strategies that the Thunder plans to utilize in the game. Those tests are meant to not necessarily make sure every answer is correct, but to help Johnson and other young bigs “learn how to learn.” According to Adams, if they’re thinking the right way, eventually they’ll get on the right track. But even this mentorship, a selfless act of time taken by Adams to help a teammate competing for playing time at the center spot, is something praiseworthy that he finds a way to twist out of. AT THUNDER CARES community events, Adams is keen on promoting not only reading and education, but most importantly, manners. On the Rolling Thunder Book Bus, Adams always encourages students to say “please” and “thank you” when they receive their free books and to the teachers and staff who help coordinate the events. Back home in New Zealand, Adams’ work with kids is equally focused on learning, but using basketball as an avenue to higher education. That’s why every summer, Adams skips across the Pacific to host basketball camps in a handful of cities on both islands of his motherland. He’s even encouraged his Thunder teammates, coaches and staff to join him on the trip, in part to show off the incredible culture, cuisine and scenery in New Zealand, but also to bring an extra level of expertise and enthusiasm to his camps. As the representative of New Zealand basketball on the world stage, Adams feels responsible for the game’s future in his country. Bryant makes the trip to New Zealand with Adams every year to push the Thunder center in his offseason workouts and to enjoy the unparalleled Kiwi hospitality. But once he’s back in Oklahoma City, Adams also leans on other Thunder staffers. Adams said assistant coach Darko Rajakovic has helped him with his free-throw shooting in an unorthodox way – by hitting him. Punches to the gut, slaps on the arm and all sorts of other distractions have helped Adams simulate the strange feeling of having the game come to a grinding halt and having to knock down free throws amid bumps and bruises sustained in game action. Fitting with Adams’ off-the-wall approach, the strange free- throw lessons have worked. After shooting 50.2 percent from the line in his second year in the NBA, Adams’ percentage jumped up to 61.1 percent in 2016-17. Now that the game has slowed down for him during his five years in the league, the next level Adams has gotten to as a player is seeing the game the way coaches do. That’s where Thunder assistant Vin Bhavnani has aided Adams. Understanding the strategy behind certain decisions and being clued into the thought process can help Adams do one of the most difficult things in basketball – translate the numbers and analytics to the players’ world of heart, toughness and guts. It’s not just the numbers, but the game film that has been intriguing to Adams. Much like the existence of a variance in language, watching tape of past games and comparing it to what is felt out on the floor can be like two different realities. Adams explained that at times in pick-and-roll coverage, he’ll think that he’s positioned higher up toward the 3-point line, but that when he watches it on film, he’s two or three feet behind where he thought he was. That gap between what’s felt in real time and what is actually happening is a real phenomenon that affects all players. For all of Adams’ growth, shrinking the divide between what he’s seeing and what’s truly occurring is the area where he most wants to improve. He also lists as a priority enhancing his anticipation of what is to come on the next play. For many NBA players, personal goals include the statistical, tangible and recognizable: a higher shooting percentage, more rebound production, extended range. For Adams, it’s none of that. Instead, it’s a cerebral way that he can help the team perform at a higher level, an improvement that makes the other four men on the floor and the coaches on the bench look good. There goes Adams again, jumping at the chance to do more of the subtle, thankless work to help his teammates and increase the chances of a Thunder win, all while taking none of the praise for it.